When disaster strikes, one of the most vital needs of survivors is access to clean drinking water. A Singapore-based company has created a mobile desalination system that could make it much easier to provide stricken areas with clean water. 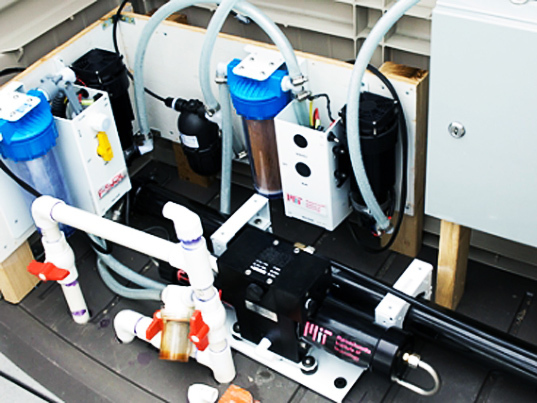 Using a shipping container as the system shell, memsys created a solar-powered desalination system specifically designed for disaster relief. The system uses Solar Power Membrane Distillation to convert saltwater into drinking water using only solar energy. The desalination unit is completely mobile, does not require any external parts, and fits inside a 20-foot shipping container. It is powered using both solar thermal and solar PV, and requires little maintenance. Unlike existing desalination technology, it does not need chemicals, diesel generators, or any other external power. Depending on the amount of sunlight, it is expected to produce, on average, 1000 liters (or 265 gallons) of drinkable water per day. The special process combines thermal distillation and membrane distillation, the most common process used by desalination systems. Water is boiled in a small vacuum at lower temperatures, 50-80 degrees Celsius (or 122-176 Fahrenheit), and the steam is passed through several membrane distillation stages, also at lower temperatures and pressures. Energy is recovered after each step in order to power the next, making it a far more efficient system than current technologies. Plus, the system is able to handle very high salt concentrations, like those found in saline groundwater. 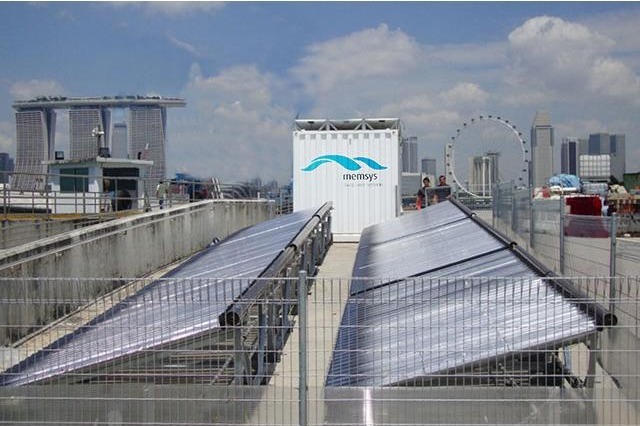 A year long test was completed in Singapore’s Marina Barrage last year that focused on system integration, the stability of operations, and optimization of output under different weather patterns to ensure that the system will indeed be successful in remote or devastated areas. Currently, about 25 companies, like IBM, are investing in the systems. While a mobile desalination system is awesome in itself, memsys is working on wider applications for the technology, including treating oil-contaminated water.